Welcome to Fishing Games Online! We feature a hand-picked collection of the top fishing games. Enjoy bass, ocean, and other fishing games! Want to showcase your fishing prowess? Want to show the whole world how high you can score in the top fishing games online? Yeah? Then you are at the RIGHT place! FishingGamesOnline.org has everything you need to make virtual fishing as fun as the REAL thing...or maybe even twice as fun! And you don't even have to leave home or take off your pajamas! With global scoreboards for many fishing games, you can go head to head against other online fishing game fanatics. And let's NOT forget - fishing games online are way MORE fun than the real thing. No more waiting for long hours...waiting for that sharp tug in your fishing line. The fun starts RIGHT here and RIGHT now at FishingGamesOnline.org! No holds barred! Just like hunting, fishing has a close and open season. BUT in FishingGamesOnline.org, close season is NOT a part of our vocabulary! The fishing fun is always on - 24 hours a day, 7 days a week, and 365 days a year. You take your pick when you want to log in and what fishing games online you want to play! Goldo - as I've said this is no ordinary fishing game. Heck! You won't hunt down or catch fishes, you are trying to catch those nuggets of PURE and glimmering gold. Hence the name Goldo. And in this game, you are in total control - how you want the cart to move, the rope, hook, and everything else in between...which is precisely why this game is challenging! Blow Fishing - this one is literally explosive as you will use dynamite to catch those fishes. This is one of the pleasures of fishing games online. You don't get arrested for dynamite fishing. :D Anyway, you are given 3 minutes every round and there's a set amount of fish you need to catch. Precision and quick fingers - you would need these! A Day In Water - in this game, you get to play as a hungry fish who feeds on the dropping flies with no problem at all. Well, there is one problem actually. You are a hunter and a hunted too! There's a fisherman trying to catch you! He's so cunning he'll drop flies with hooks attached to them instead of the usual bait. Munch on those hooked flies and you are toast! So what are you waiting for? Don't stare at this page! 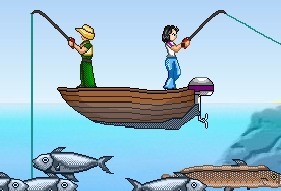 Let the fishing fun starts here at FishingGamesOnline.org!